Well, it’s done… We’ve just finalized the decision of where to send our daughter, Mary Kate, to college and I can’t help but think of the line from Who Wants To Be A Millionaire, “Is that your final answer?” complete with ominous music playing. The process of choosing a college can be overwhelming, but I have to admit, this time it was absolutely grueling. And, what really kills me is that, upon hearing where she will be enrolling in the fall, I know almost everyone will respond with, “Well, that was a no-brainer. Of course that’s where she’s going.” They’ll say this because it’s the same school that all three of our sons attended, as well. Yes, that’s right. The original list included becoming: a Huskie, a Leatherneck (I kind of like that one), a Redbird, an Illini and a Hawkeye. And…drum roll please…the final answer?…more drum roll… come this fall, she will officially become a University of Iowa Hawkeye. But, the decision was in NO WAY an easy one. Did you notice the capital letters? I hope so because I really meant them. In fact, Mary Kate said she was thinking that maybe she could be the different one in the family and make her own way at a different school. We assured her all along that she should not feel like she HAS to go to, what has become, quite unintentionally, the school of choice for our family. She could do her own thing. But, after an exceedingly agonizing deliberation, she settled on joining the percussion studio at Iowa. With her brother. This whole journey began just a few short months ago. Last year, when we were discussing a career choice/college major, she told us that she really couldn’t imagine her life without music and wanted to try to gain admission into a music school. As I have written numerous times on this blog, the application procedure for these things is pretty insane and so the announcement of another round of music school applications and auditions filled me with dread, quite honestly. Refer to my posts: The Sound of Music (School Apps)…AARRGGH 10/26/12, Have Stick Bag, Will Travel 2/1/13 and Your Kid’s Majoring in What??? 10/18/12 to get a better understanding of which I speak. However, my husband and I were happy that she had some leanings regarding the direction she wanted to take. The reality though, is that getting into a music school, and percussion studio in particular, is no easy task. Following the auditions, typically only 3-5 students are accepted each school year. And, while we thought she was talented, we knew she’d be up against some incredibly experienced students who had the benefit of attending large, public high schools with amazing music programs…the complete opposite of her background coming from a small, private school offering very little in the way of instruction, as our one band director makes up the entire music department. Although, in his defense, he is a good man who cares enormously about his students and does the best he can with the little support he gets. Add to that, the fact that she attends a different school than the one in which she is a band member and you end up with a rather haphazard band experience. During Peter and Mary Kate’s auditions, I had to constantly remind myself that, while both would have unquestioningly benefited from a public school music program, that was not our priority when we decided on their high schools. Seriously, I was constantly reminding myself of that fact. We did learn from our older son’s experience, though, and arranged for an additional private instructor to help strengthen Mary Kate’s mallet skills on marimba and vibes to augment her long-time drum set instruction. (Sidenote: It occurs to me that those of you who don’t know me might think that I live an upper-class moneyed lifestyle in order to afford private schools and music instruction. The truth is that we are absolutely broke because of the very fact that our kids have attended private (parochial, really) schools and music instruction. It’s just that these things were important enough to us to make the enormous sacrifice.) Continuing…In a rather comical effort to prepare Mary Kate for the expected response from college professors, her new teacher said, in a very tentative, sweet manner, “Okay, now, I have something to tell you and I don’t want you to be too terribly offended.” Wow. But, she just looked at him and said, “Okay.” He then spilled out that, upon hearing that she’s a product of this little school, the professors are going to automatically assume that she’s not any good. To which she coolly and confidently responded, “Okay.” But, he quickly added, that this would be her secret weapon, assuring her that they would be shocked at how good she is, especially on drum set, which is unexpected for girls. So, she spent the entire month of February auditioning at various Universities and, overall, felt pretty good about her performances. The results? She not only got admitted into every school to which she auditioned, she was offered scholarships, as well. Two of the schools have been actively pursuing her, one very aggressively. What started out as a, “Gee, I hope I can get in somewhere” had turned into a bidding war between schools! Who knew? This was crazy. Our little Mary Kate was proving to be a dark horse. She never felt that she was as good a musician as her brother, Peter, even though he has been a source of unending support for her. And she never really believed him or her private drum set teacher when they told her over and over again that she was good, and, much to the amused chagrin of her big brother, predicted to possibly surpass him. 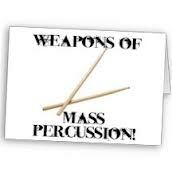 Suddenly, we were in a position of choosing between two Universities with highly regarded music schools and percussion studios. One department head informed us that hers was the single largest School of Music Scholarship offered to a student in the nine years that the he has been teaching there. And the two professors there told us over and over that they were “blown away” by her audition and her musicality. Leaning in the direction of that school, we then headed to a performance at the other, only to be told by the Head of Percussion there that he had decided to increase the already impressive scholarship originally offered because he wants her. Our heads were swimming. I mean, when did our little girl turned into such a powerhouse? So, while we have been in the rather enviable position of choosing suitors, we also found ourselves grappling with the very unexpected feelings of having to reject someone. The unusual thing about music school is that a student works very closely with the professor every day for four years. Having had two sons go through college, we can say that, not only did we never meet a professor, the thought never crossed our minds to meet one. We couldn’t even tell you the name of one. I doubt they even remember one. But, in music, a relationship is formed. And it is often a relationship that lasts a lifetime, including working together. That is what made this decision so terribly difficult. In just a few short months, we managed to forge a close bond with these guys. In her communication to decline admission, she made it very clear that it was, by no means, an easy decision and that she hopes to one day have the opportunity to work with them. That would be really cool. So, for now, we’ve added another Hawkeye to the family. Maybe she can bring the football team some good luck. On second thought, we’d better not burden her with that responsibility. Great job MK and remember…On Iowa and Go Hawks! PS: I am adding this post script several hours after the original blog was published. An interesting turn of events has taken place regarding a third school. Upon receipt of Mary Kate’s email informing them of her declining their offer of admission, the department professor responded with an offer of a scholarship and asked her to reconsider because they want her. Talk about complicating matters…I mean who IS this kid? Congrats to your daughter. It sounds like you have a very musical family- what a gift! I think it is awesome that they form such a close relationship with the professors. Very unusual for college. My second born, my son, goes to a smaller private college. He too has formed relationships with his professors. My daughter went to The University of Oklahoma- totally different experience. Agreed as far as the different experiences of a small school vs a large one. That’s the nice thing about being in a music studio at a large university – it shrinks the school so you get the large school benefits but the feel of a small school. Thanks for reading & for your comment. Hahaha…love it- The Suit! Our oldest studied economics and now works for a large oil and gas company. Our youngest, the one at the small private school, is very creative too. He’s going back to France this summer for an immersion course. Not sure what he is going to do after his next year of college. I have faith he will find his way. I am so happy for your daughter. To think that schools were actually competing to get her is incredible. My daughter ended up not really having a choice in colleges. There was only one college with a culinary degree in Indiana that we could afford. I am proud to say she will be graduating tomorrow with a dual Culinary Arts/Restaurant Management degree. Our children really do make us proud. I so enjoy reading your blog. Congratulations on your daughter’s graduation! That’s fantastic & I think culinary is awesome. That’s a very creative, artsy world too. Thanks for reading my random blatherings! I like your site as well-keep writing! Congratulations, MK! And three cheers to her awesome parents for being their kids’ greatest fans. Sounds like an excellent choice, and I’m sure you’re all relieved to have it finalized. Thanks Marian! I know we’re pretty proud of her & basically just kind of stunned to be honest. Thanks! I like the mascot names too – especially Leathernecks! I mean, how cool is that? Thanks for reading & for your comment. I like that you don’t use capital letters! Wonderful news! I am so happy for you guys! So proud of Mary Kate!